Every year, a week is set aside to honor our hardworking Housekeeping associates. This year, International Housekeeping Week is September 9-15. Housekeeping, often referred to as heart of house services, is one of the toughest and most important jobs for every property to ensure guest satisfaction and prevent illnesses. At The Service Companies, International Housekeeping Week is a big week-long event. 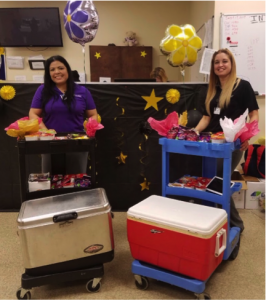 Each housekeeping department leader holds events and arranges games, gifts, and a few surprises for their team members to ensure they know how important they are. International Housekeeping Week started back in the early 80’s as a directive from the Uniting Facility Managers Worldwide President. The week was used to recognize the “doers” in the housekeeping profession. The first official theme was “Our Profession Is Clean.” Since then, different themes and slogans have been featured each year. Today, themes are not used as much as they once were, but the week is still a special opportunity to acknowledge the outstanding efforts of every member in your housekeeping team. 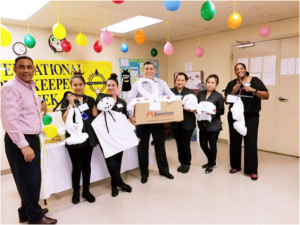 Thank your housekeepers for a job well done, reward their dedication, inspire their continued efforts, and boost their morale through meaningful gestures and thoughtfully planned activities. During this year’s Housekeeping Week, make sure to give an extra special “Thank You” to all of your housekeeping team members. Perhaps jump in and help out by cleaning a room, making a bed or scrubbing a toilet – you never know what you might learn! Here are some ways to make International Housekeeping Week special for your team! Who doesn’t love a little competition? Surprise your housekeepers with fun games and activities that will give them a positive start to the day. Put your team’s skills to good use as they compete in a bed-making contest! Choose the winner based on the fastest time and the bed that looks the neatest. Put a twist on a classic game! Hand out custom-made cards and swap out numbers with terms that relate to your property. Grab a bucket and a roll of toilet paper and see who has the best three-point-shot on property. Extra points for trick shots! A classic game that is simple and always enjoyable. Play the game to your housekeepers’ favorite songs. What is better than surprising your team with fun games? Awarding your winning team member with a prize! Here are some prize options won’t break the bank. Spoil your housekeeping associate with a $25 gift card of their choosing! Say thank you to your winning housekeepers by paying one of their personal bills for the month! Whether it’s for their cell phone, water, or cable, feel free to cap it off around $50. Draw a name out of a hat with a gift of your choosing. This easy, yet special, surprise will make one of your team members’ day. Movie tickets are a great way to give your winning team member a relaxing night out! Pick a few different prizes and display them in your property office; make sure each prize has a corresponding bucket. 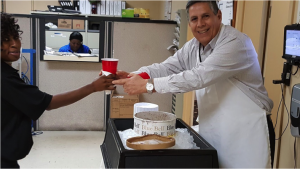 Each day, give a raffle ticket to the employees who show up to work on time and volunteer to play the games. Have them drop their raffle ticket into one of the buckets of their choosing after each shift. At the end of the week, randomly draw a raffle ticket from each bucket! Your managers work hard to keep your property running smoothly. Make sure to extend a special “thank you” for all that they do! Have a personal card written for your day-to-day managers. Include a kind note or some photos. If you are feeling extra generous, feel free to include a monetary gift.